Adrenal surgery involves removal of one or both adrenal glands. 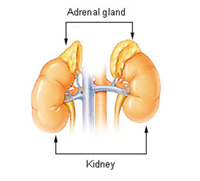 The adrenal glands are paired endocrine glands located above each kidney. The surgical procedure of adrenal gland removal is known as an adrenalectomy. Tumours involving these glands may be benign or malignant (cancerous) and often secrete hormones, which may cause high blood pressure, fluid retention, headache or sweating. Phaeochromocytomas are a type of adrenal tumour that can cause life-threatening hypertension, heart attacks or strokes. They may require a period of medical control of blood pressure before surgery can be safely performed. Diagnosis of the type of tumour will involve urine and blood tests as well as imaging with CT or MRI scans. Adrenalectomy can be performed either with laparoscopic techniques or open surgery. Laparoscopic adrenalectomy is usually indicated for non-cancerous (benign) adrenal tumours. This technique uses small incisions instead of a large incision. A small incision is made in the flank (side of the body, between the ribs and the hip) through which a laparoscope (a thin telescope like instrument) is inserted. The laparoscope is attached to a tiny video camera which enables the surgeon to visualize an enlarged view of the site of operation on the television monitor. Carbon dioxide gas is introduced into the abdominal cavity so as to inflate it and give a clear view of the operating area. A further two or three small incisions are made through which surgical instruments are inserted to perform the adrenalectomy procedure. The skin incisions will be sutured and covered with a surgical dressing. The advantages of laparoscopic adrenalectomy include less postoperative pain, a shorter hospitalisation period, minimal scar, reduced chronic pain from nerve injury, minimal risk of developing hernia, and a fast recovery with a much quicker return to normal activity. The anterior approach is most commonly used and involves a vertical incision made in the middle of the abdomen or a diagonal incision just under the ribcage. The surrounding structures are moved apart to expose the adrenal glands. As this approach provides better exposure, it is used for large adrenal tumours, particularly if a malignant tumour is suspected and if removal of other organs invaded by cancer needs to be done. In the posterior approach, a curved incision is made on the side of the gland to be removed. The surrounding muscles are moved aside using retractors. During this approach a part of the lowest rib may also be removed. This approach does not provide a wider and complete view of the surrounding structures as with the anterior approach. Hence, it is not as useful for very large tumours or where other organs may need to be removed. The thoraco-abdominal approach is rarely used but may be indicated for very large tumours. In this technique a large incision is made which extends through the abdomen and the chest to provide wide exposure of the area. This approach may cause increased postoperative pain and lung complications. The risks of complications are higher with open surgery compared to the laparoscopic surgical procedure. Possible complications of adrenal surgery include lung problems, wound infection, bleeding, scarring, formation of blood clots in the leg veins which may travel to lungs, adrenal insufficiency (inability to produce enough cortisol), and damage to blood vessels and adjacent organs (spleen, liver, pancreas).